Hi readers! Here is our second Try the World review and recipe! 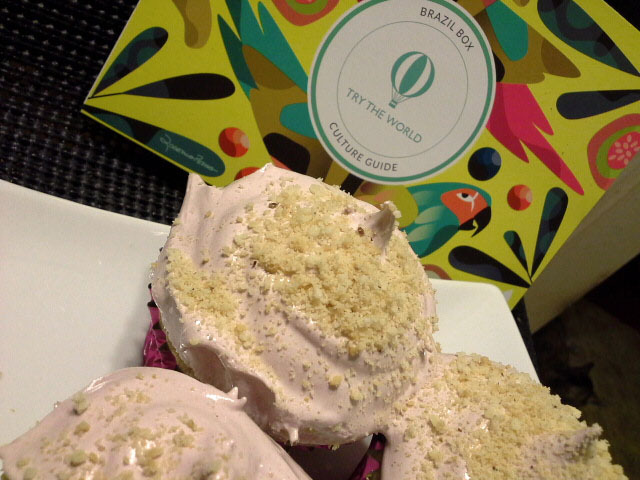 Traci made Brazilian Nut Cupcakes with Geleia De Jabutivaba Frosting! 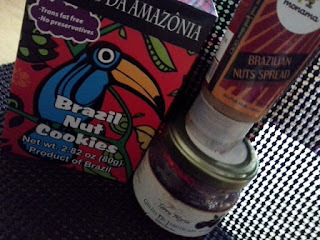 The box I received from Try the World, filled with ingredients from Brazil, was so amazing. I was lucky enough to get one in advance and am very thankful. Not only did I get a great variety, everything inside it is so interchangeable. I am still making new things! You'd be amazed at the combinations that can be made out of one single box. The guide also helps, because it describes each and every ingredient to a tee. I decided to use three of the ingredients to create a fantastic cupcake for you. But, there are infinite possibilities within this box. Line a 12-cup cupcake pan with inserts and preheat your oven to 325°F. In one bowl, mix all dry ingredients. In a mixing bowl, combine eggs and sugar. Mix on medium speed. Gradually add butter. Mix until frothy. Add half of the dry ingredients and combine well. Add all of the milk. Add the rest of the dry ingredients and mix until combined. Add the Brazilian Nut spread until combined. I used a measuring cup to fill the cupcake pan and make the batter even (use whatever works best for you). Bake at 325°F for about 20 minutes, or until done. Place on cooling rack. Combine all ingredients well. Chill until firm. Spread onto cooled cupcakes, sprinkle the crushed cookies on top and serve. Try the World is a fantastic company! Knowing the country of origin and getting the guide to help you with the ingredients is so awesome. I highly recommend this box. Go Brazil!! !